[T]he magnitude of discretionary funding cuts for the duration of this fiscal year proposed by House Republican leadership has grown substantially, especially considering the short time frame for implementation. After the House Appropriations Committee detailed $74 billion in cuts last Wednesday, a number of conservative members demanded $26 billion in additional cuts to make good on the "Pledge to America," bringing the total level of cuts relative to President Obama's FY 2011 budget request to $100 billion. A full $100 billion cut to discretionary spending would likely result in job losses on the order of 994,000, using OMB's GDP projections (CBO's projections are based on current law) and assuming a fiscal multiplier of 1.5. H. Con. Res. 34 - "The Ryan Budget"
Over the next five years (during which time CBO projects that the economy will still be below potential), Chairman Ryan's Medicaid proposal would cut the program by $207 billion, which includes both eliminating the Medicaid expansion under the Affordable Care Act and even deeper cuts to the Medicaid program. Using a standard macroeconomic model that is consistent with private- and public-sector forecasters, we find that a $207 billion cut would result in a loss of 2.1 million jobs over the next five years, or 2.9 million full-time equivalent jobs. These figures are in job-years, which refer to a job held for a single year, meaning that five jobs lost in a single year is the equivalent to one job lost over five years. 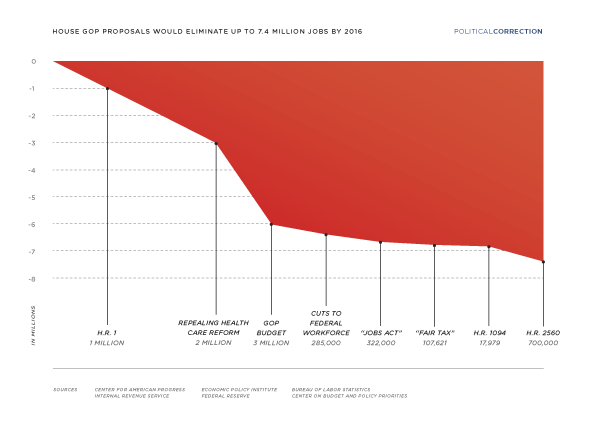 Furthermore, the job loss would overwhelmingly be in the private economy. Medicaid has very low overhead, as about 96% of the program's funds go toward benefits which are spent in the private sector. Assuming the 96% ratio is relatively constant across states (or at least not systematically biased in one direction), Medicaid cuts of this magnitude would result in the loss of just under 2 million private-sector jobs, or 2.8 million full-time equivalent jobs.